How Much Money Should You Start With? The day before the sale, I withdraw $40 from the bank. Ideally, I want four $5 dollar bills, fifteen $1 dollar bills, and $5 in loose change. If the bank is closed and I visit the ATM instead, then I just buy a pack of gum somewhere using one of the $20’s and ask for the change in all $1’s. Then, either at the same store or wherever I go to buy a soda, I ask the clerk for four $5’s in exchange for my $20 dollar bill. Prior to every yard sale, I also head to the nearest Coinstar to turn all of my loose change (mostly pennies, nickels & dimes) into dollar bills. Depending on how much I have, I may not even have to visit the bank at all! When you cash out after using Coinstar (at my local Kroger store, I just hand the Coinstar receipt to the checkout clerk), you can ask the clerk for any combination of dollars and coins that you want. TIP: Be sure to write down the total of all the change you’re starting your sale with, so you can accurately calculate how much money you’ve made at the end of the day. The Cash Register Garage Sale App is a simple way to keep track of multi-family sales, have multiple cashiers at your yard sale, and track your yard sale totals. Your most important issue with money during a yard sale is: How to make change quickly! Without a doubt, it’s much easier to make change if you have your coins separated from your dollar bills. And it’s even easier yet, if you have your individual coins separated by denomination. So it’s wise to have some system to at least keep the bills separated from the loose change. Best of all is a way to keep all denominations of your garage sale cash separated. #1 – A cash box with individual coin sections and/or dollar bill trays. 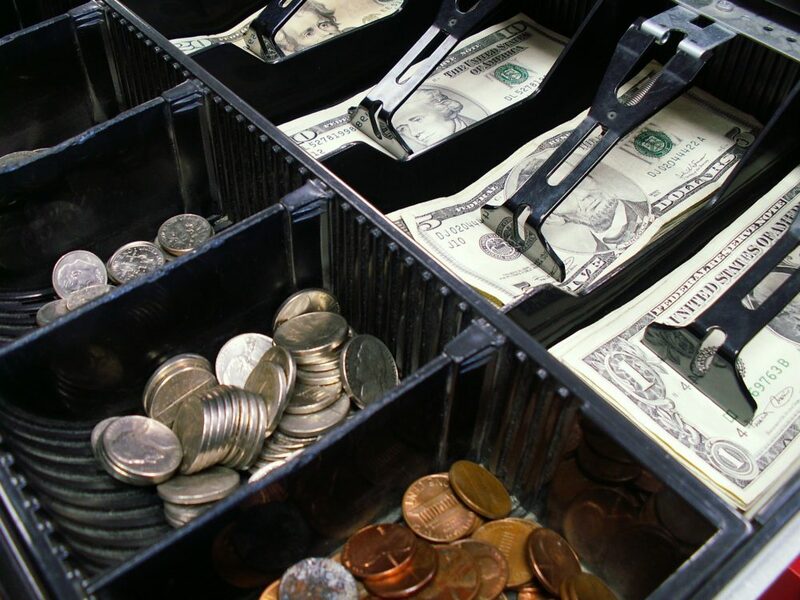 There’s no better way to stay on top of your earnings and make change in an instant than to use a cash box with separated sections! #3 – Individual money bags. You need 2 money bags — one for the dollar bills only, and one for all your loose coins. These could be official bank bags, but I just use heavy-duty zippered dark colored bags. They’re called money bags, but there’s no lock or security features to them. I got mine at Wal-Mart. #4 – Zipper/slider plastic food storage bags. They’re not ideal, but they’ll work. Zippered food storage bags are clunky, and sometimes awkward to open & close. Plus, unless you hide them, everyone can see your stash of cash. One good thing is that you can see exactly what’s inside, so you’re sure to grab the right one each time! My all-time favorite is the garage sale cash box. It’s quick and easy, and keeps you 100% organized all throughout your sale. My second favorite is the money apron. It’s very convenient to always have change right at your fingertips, but it’s harder to “see” which denomination of coin or bill you’re grabbing. Third favorite is the heavy-duty money bags. Fourth favorite is the zipper/slider food storage bags.